Many of the current “desktop” dye sublimation production companies are now considering taking the next step up to a wide format sublimation set-up. It may make sense if you are one of those busy shops that are currently using the Ricoh printers with Sawgrass ink cartridges. If you are one of these companies, then what is the Return on Investment (ROI) for making the switch? Excluding a heat press the calculations are pretty simple. If you are currently buying Ricoh SubliJet ink in cartridges at $ 126.00 per 60ml cartridge then your liter ink cost is $2,100.00. The liter ink cost for wide format sublimation ink is $ 125.00. Figure that for most full color images you will use between 1 ml to 1.5 ml of ink per square foot. The ink cost of a square foot of printing for the small format solution is between $ 2.10 and $3.15. For the Wide Format solution the ink cost will be between $ .125 and $.1875 per square foot. So, say the wide format printer package costs $ 7,495.00. How many square feet of printing do you need to do to justify the initial price based on ink cost alone? Using the higher coverage number of 1.5 ml per square foot then if you print 2,530 square feet of transfers, then you will be able pay for the initial cost of the wide format sublimation printer. If you average about ½ of a square foot for your image on a t-shirt, then, when you print 5,060 shirts you will have paid for the printer. Adding to the savings is the fact your paper costs are much lower. The cost of the wide format sublimation paper is from $ .10 to $ .12 per square foot while the small format sublimation paper is about $ .20 per square foot. This is an additional savings of $ 08 to $ .10 per square foot of paper usage. Wide format printer packages start at $7,495.00 including 4 liters of ink, paper, bulk feed system, and RIP software with profiles. 60 ml of Ricoh SubliJet ink costs $ 126.00. So if you were to use 60 SubliJet cartridges (or only 15 sets of CMYK) equal the same amount of ink (4 liters) that you will get with the initial wide format package. Those 60 cartridges @ the $126.00 price per cartridge = $ 7,560.00. Basically that is the cost of a new faster wide format printer that includes an equal amount of quality sublimation ink. Who doesn’t want a FREE wide format printer? Coastal sells and supports both the Epson and the Mutoh printers for wide format sublimation production and have printers from 44” to 104” and can help you design the exact solution that is best for your specific requirements. If you think you are ready, contact our Professional Solutions department to speak to an expert. Aaron Montgomery of the 2 Regular Guys Podcast (also our Director of Sales and Marketing) got Catalina Frank from Epson America on the phone and asked her the below questions about the new dye-sublimation Epson-F Series printers. Why wide format sublimation? What’s the hype all about? What are the biggest draws to wide-format? Is it about higher-quality goods that you can sell at a higher price? Or is it more about generating volume in a more reasonable time? In what other markets is this technology being utilized? What industries has it seen the most success? Does this translate to the awards and apparel markets? How? When did this technology really start to take hold? What was the launching point that really set it up for gaining market share? What kind of lateral market opportunities does this open up? Do you think it’s a good or bad thing for businesses to become more of an all-encompassing “digital decorator” versus an apparel decorator or awards retailer? Why? I have been in the sublimation world for 13 years with many more years before that in the graphic arts. This is my chosen field because I have a love for the beautiful things that are created using the production tools that are now available. The results justify the efforts and expense to produce them. I am not particularly a creative person so my world is to help those who are creative, produce the results they expect. I was offered a position to help start a company to sell sublimation inks, paper, printers, etc. I said what on earth is sublimation? As soon as I saw the end products, I was flabbergasted on the vibrant colorful products that can be made with sublimation. When I started in this business, digital sublimation was in the dark ages with desk top office ink jet printers (think Epson 3000 or Epson 850) producing the bulk of the sublimation transfers for personalized product decoration. Larger projects were made with electrostatic (gasp!) printers that were broken more than they were printing. The first wide format ink jet sublimation printers were also a challenge with the printer companies not supporting sublimation inks in them and they were very, very, very slow. The inks worked but ink companies had trouble making consistent inks from batch to batch. Sometimes an entire batch of 1 or 2 colors would kill print heads at multiple customer sites. Recalling inks and replacing print heads was a huge and expensive headache and further slowed the growth of sublimation production. Sublimation production companies had to learn fast on how to maintain and repair their own printers to keep them running or pay to have a technician on call in case of a break down. Who was to pay for all these problems? The ink company, or the printer manufacturer, or the distributor, or the end user was always a big problem back then. A lot of finger pointing was going on so no one was truly happy with those old solutions. Thankfully, over the years, inks have improved, paper technology is much better, RIPs are better and the printers are more robust and reliable than ever before. The sublimation decoration market continues to expand and grow year after year. Even with all these improvement there is still one thing missing …..
A complete solution from beginning to end with no finger pointing at the other guys when something goes wrong. Enter the new Epson dye sublimation solution with the full package of printer, inks, paper, RIP software with full Epson tech support. No more finger pointing, no more questions about who’s at fault for the problem. Now isn’t that refreshing! Ok, Epson so what exactly do you have for us? 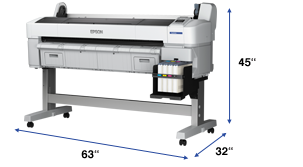 The Epson F-6070 44” wide printer and the Epson F-7070 64” wide printer both come with 1.5 liter capacity ink reservoirs. Both printers include a full set of Epson UltraChrome DS inks, the Wasatch RIP, Color Profiles provided by Coastal, and a test roll of paper. The production speed of these printers is around 300 Square feet per hour. Epson has designed these printers from the ground up specifically for dye sublimation printing. The Epson TFP print head is made specially to work with the Epson dye sublimation inks. The low initial cost for the printer packages and very aggressive ink pricing will keep your square foot production costs low. And of course full Epson support. – One year warranty – printer registration required within 90 days of purchase. 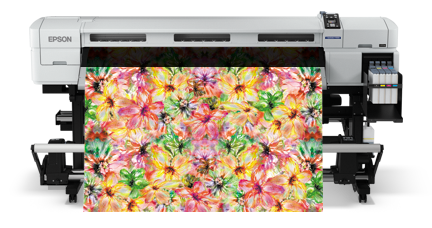 If you are ready to upgrade your current sublimation printers or want to take the plunge to add wide format sublimation capability to your current product offering. Check out the deals at www.coastalbusiness.com or call us at 800-562-7760 or you can e-mail me at rfoltz@coastalbusiness.com for quotes and questions.